Posted on Wed, Feb 22, 2012 : 5:58 a.m.
As the owner of the Herb David Guitar Studio for 50 years, I have experienced the highs and lows of the ever-changing “Downtown, Liberty and State Street” businesses. The blatant shift from individual driven, personal care and service, to generic, cookie-cutter franchise establishments is destroying the once inventive and diverse city we all love. Especially hard hit is the Liberty Street corridor. This is mostly due to the never-ending construction of the (underground) parking garage at Liberty and Fifth Avenue. It has impacted the shopping and driving patterns to such an extent that the businesses that have been the street’s anchors are on “life support.” Retail is dying and the restaurants next to the parking garage are barely holding on. 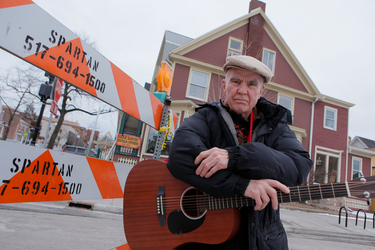 Herb David poses where South Fifth Avenue is blocked off at East Liberty Street in downtown Ann Arbor for the ongoing construction of the city-owned underground parking garage. Herb David Guitar Studio is housed in the building behind David. Several of the most affected business continually try to get some relief from both the Downtown Development Authority (DDA) and the Ann Arbor City Council to little avail. The finish date for the project is always changing, and there is still no plan for what goes on top of the parking lot. How long could that take? We have gone to both the City Council and the DDA, proposing at least a tax abatement for those most greatly affected. Each time the mayor says he doesn’t want to set a precedent for this situation. Yet the city uses this PRECEDENT routinely to attract new businesses because of the future revenue they will generate both in taxes and visitors to the area. We have paid and generated money willingly for the city for years and have supported the growth of the business community. It is time for the city and/or the DDA to step up their moral responsibilities toward the long-time business owners in this area and extend a helping hand toward making sure we can still be here at the end of this parking structure saga. If the city and the DDA chose to invest in a new parking structure, it needs to also invest in its business community, especially the ones that made the city grow. We are small. We are independent and diverse. We are working close to the bone, often using our life savings to stay in business. This is not just about the economy, it is about the parking structure, the closing of Fifth Avenue and restricting traffic flow in the entire area for three years, losing customers who chose to use alternate less frustrating routes to avoid the construction and travel time delays. The Liberty corridor was too dark, for months the streetlights were not functioning. Many people chose to go elsewhere where parking is closer and traffic routes are more convenient to their destination. Most of them, we hope, will return when things improve. It is our desire to survive and succeed and with community support and greater consideration and help from the City Council, mayor and the DDA we will. Herb David is a long-time Ann Arbor businessman who owns the Herb David Guitar Studio at the corner of East Liberty Street and South Division Avenue in downtown Ann Arbor. Thu, Feb 23, 2012 : 6:18 a.m. It's a bit rich for the mayor to worry about setting a bad precedent when we're talking about helping a handful of businesses literally cut off from commerce for years. How often is that going to happen? And relative to this project's budget, how much are we talking about? 0.01%? Show a little heart for something other than bicyclists, John. That said, I am sick of the majority of people on this website constantly complaining about progress. Ann Arbor is growing, and it seems only the mayor has the stones to think ahead of that. It's shocking to hear so many so-called liberals spew this tired small government nonsense day after day. I want a darn place to park downtown, and I am thrilled this structure will finally give me a fighting chance. I went downtown Monday night and, as usual, it was like a death match trying to find a space in a lot. We need more parking to grow, and it's can't come soon enough. Wed, Feb 22, 2012 : 8:53 p.m. Seems to be this is the DDA's baby and they should be compensating these businesses, not the City. Wed, Feb 22, 2012 : 5:48 p.m. I agree with Mr. Hendel. Street repairs, new garage construction, etc. are all things which unfortunately impact businesses, however I don't see that it's the government's place to bail them out. It WOULD set a bad precedent . It's unfortunately one of the risks one takes when one goes into business in any environment, urban or suburban. As far as the uniqueness of Ann Arbor, change is (often sadly) inevitable. I just don't think that the taxpayers who are already burdened with the hopeful improvement of downtown parking, should also have to bail out affected businesses. Wed, Feb 22, 2012 : 4:52 p.m.
Susan Pollay should resign in disgrace. The A2 DDA might as well be located in DC with the level of support they have given those effected with this wasteful project. Wed, Feb 22, 2012 : 3:41 p.m. Wed, Feb 22, 2012 : 3:26 p.m. Wed, Feb 22, 2012 : 3:27 p.m.
the last two words of the sentence were &quot;big buildings&quot;. Wed, Feb 22, 2012 : 3:25 p.m. I don't want to sound like a conspiracy theorist, but really, I have to agree with the writers who have posited an ulterior motive to the mayor, the City Council, and the DDA, in refusing to give any assistance to the struggling businesses on Liberty. We know the city gives tax breaks to businesses all the time, so going on about &quot;not setting precedents&quot; is ridiculous on the face of it. The only possible alternative explanation is that the development folks hope that these small independent businesses, which don't fit their glossy, Birmingham-esque vision of downtown Ann Arbor, will just go away. Wed, Feb 22, 2012 : 5:50 p.m. Wed, Feb 22, 2012 : 2:24 p.m.
Herb David Guitar Studio attracts hundreds of people downtown every week for musical lessons. One of the few businesses' in the downtown area that can say that. Border's was another but they are no longer there. The loss of Herb's studio would certainly be felt by other business's downtown. I don't understand why the city/ DDA doesn't try to protect such a resource. You could even argue the city has gone out of its way to harm the business. The city council provided tax breaks to Pfizer so there IS precedence for giving breaks to established companies. Of course the city got burned in that deal. Here we have a small business owner that has provided musical instruments and lessons to the public for decades. I think something can be done for Herb David and the other shops that have suffered financially with the construction of this &quot;hole&quot;. The city council, mayor and DDA just need to step up and do the &quot;right thing&quot;. BTW: When is this lot going to be completed? January?, February? March? July for ART Fair? I have heard all of these dates thrown around and I still see them pouring concrete. At least give a firm date. The weather has been very cooperative. Wed, Feb 22, 2012 : 2:22 p.m. I hope some city officials read this opinion and the comments on it and pay attention. Three years is too long for all main access to be closed to these restaurants and stores. I'm not a musician, but I have made a point of frequenting Jerusalem Garden and Earthen Jar more than I used to, in a small attempt to bolster their revenue. I hope others are doing the same - we can use community support to help a little bit. But the city ought to take some responsibility for the extended catastrophe and its effects on these businesses. Wed, Feb 22, 2012 : 2:14 p.m. I feel bad for the affected establishments in the here and now, but when this &quot;boondoggle&quot; is completed who will be reaping the benefits first? Wed, Feb 22, 2012 : 2:48 p.m.
You are assuming they can hold on that long. Wed, Feb 22, 2012 : 2:04 p.m. This whole matter is a disgrace. The Mayor and a number of his associates on council have been systematically undermining downtown and the near downtown by promoting unplanned, mindless development at the expense of existing small businesses (and residents as well). The issue is not &quot;precedent&quot; but fairness and concern for the health of the area and respect for those who have been part of the back bone for years. Whatever one things of the wisdom of the big hole, it has been going on for too long and has had too much of a negative effect on the area. We elected people to support the well-being of the city, not to play games with semantics. The DDA seems to have outlived its usefulness and becoming more of an obstruction to the health of downtown than a help, but it is unelected. Council has an obligation to its constituents and needs to act immediately to assure that no one goes out of business because of their construction mistakes. The businesses in question have all been very good citizens of the city, contributing much beyond retail--help them! I agree, on balance, with Mr David's argument. It ISN'T necessarily correct that what's good for one particular business (the Guitar Studio) is good for the downtown as a whole, and it IS true that the City does not normally compensate businesses for inconvenience suffered during the construction of public works (e.g. roads); nevertheless, the parking garage construction has been such an exceptionally big and time-consuming project that some type of special consideration for affected businesses is appropriate. If some of our elected officials would take their heads out of the clouds and stop dreaming about new train stations and grand works of public art, they might have time to come up with a fitting remedy for this problem. C'mon, you just need to quit being so darned self-centered and think about the GREATER GOOD. As defined by the DDA, ma;yor and city council, of course. Plus when those businesses go under we can get a nice new craft waffle restaurant or something like that. Wed, Feb 22, 2012 : 12:03 p.m.
&quot;Development&quot; is their middle name. It's like in the old cartoons where the one character looks at the other and just sees a nice meal (with all the trimmings). DDA sees Herb David and the restaurants as quaint, undeveloped vestiges of the the 60's. Highest, best use, indeed! Wed, Feb 22, 2012 : 11:53 a.m. Hear hear, Herb. The Big Dig is a perfect example of mismanagement, dishonesty, and unjustified wasteful spending. At this point, depressing as it is, I have to wonder about the possibility that someone involved thinks that the land under Herb David, Jerusalem Garden, and Eathern Jar is too valuable and should be built up, or their &quot;friends'&quot; business should move in. Thus, ridiculous project delays and refusal to own up to their insane mistakes and pay some form of restitution to the businesses involved, just waiting for them to go out of business and/or move out. Seems over the top, but for crying out loud, at this point what are the other possibilities? If the project had been even CLOSE to on-time, I would not think payment to the businesses would be appropriate. At this point, though, it is nothing but. They should never have started this project, and it should never have gone this long. Plus, I feel safe in assuming the cost of the Big Dig is more than what was initially quoted. Wed, Feb 22, 2012 : 11:47 a.m.
Or, we could just let these businesses go under and board them up, that will add to the ambiance of the city in a positive way, eh? Let me take Mr. David's idea a step further, how about declaring those businesses a &quot;sales tax free&quot; zone as well, you would think that the State would also have a stake in growing and maintaining businesses in Michigan. Wed, Feb 22, 2012 : 11:29 a.m. The &quot;Big Dig&quot;: $59 million of government boondoggle.